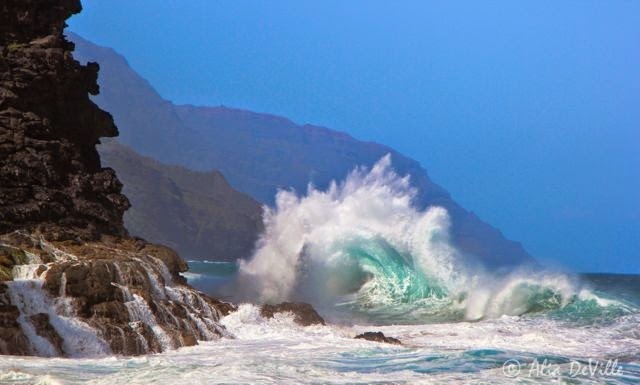 Part 2...Why would YOU want to visit Kauai?...Today, the flip side...Any reasons, "why not?" Overcast days at the beach still present a pleasant experience. Whenever we make suggestions or recommendations we consider that many people may not be candidates for our suggestions for any number of reasons. Under certain circumstances, travel may not be an option due to health issues or concerns, personal finances or merely a distaste for the nuances of travel of which there are many. We also understand that a certain faction of our readers have no interest in travel itself but enjoy following our day to day activities. Our vast number of readers are somehow inspired to follow our day to day posts for which we are very grateful for their interest. These downed trees not only provide shade but also a habitat for insects and small critters of which there are few in Kauai. As a result, we feel it is only fair for us to disclose our perceptions on the flip side of any suggestion we may make...what are the drawbacks? Within that framework, if only one reader decides against following our recommendations and chooses an alternative path, then we've done our job by showing both the good and not so good. Isn't all it about perception anyway? If someone had told us, "Kauai is mostly for serious hikers with many dangerous trails and tide pools from which many tourists are killed each year," we may have stayed away. There's always a chicken on the beach. months of daily postings with hundreds of photos. What are the drawbacks to visiting Kauai from our perspective which, please keep in mind, may be very different from yours after staying here for this extended period of time? (However, we've yet to meet one person who doesn't love Kauai). These billowy white clouds are seen almost daily. There's rarely a time of solid blues skies in Kauai for longer than a few hours. 1. Price of vacation rentals: Renting a modest single family house under $10,000 a month is difficult if not impossible to find. However, if two couples shared in the cost of a multi bedroom house for a few weeks it becomes more affordable, certainly no more costly than a hotel. For an average condo rental, small such as ours at 700 square feet, the rental rates vary from approximately $150 to $200 per night. Many offer special weekly and monthly rates. In our case, due to our frequent mention of the condo here on our site, providing great exposure for the landlord in addition to our long term stay, enabled us to benefit from a significantly reduced rate which is often the case for our long term rentals. You know...a bird in the hand. Having a condo with a full kitchen cuts down on the necessity of dining out for each meal. More on that in a moment. 2. Price of hotels: The St. Regis in Princeville starts at about $550 per night, the Westin Princeville at $337 per night, and the Hanalei Bay Resort at $199 with numerous other options in between. Other areas such as Lihue, Kapaa and Poipu Beach have prices beginning at $175 a night on up. Of course, staying in a hotel adds to the rate when including WiFi fees when not included, tips, taxes, resort fees, meals and tempting purchases. Zooming in on a tiny bud. 3. Cost of meals in restaurants with tax and tips: Considering each time we've dined out, each at mid range restaurants, we've spent an average of $72 per restaurant visit, keeping in mind I don't drink alcohol and Tom never ordering more than one cocktail. Also, we don't order appetizers or desserts. That's for one meal for two people. If one had two or three meals out per day at mid range local restaurants the cost would be from $125 to $200 per day or more depending on alcohol, sides and desserts. However, these costs may be typical for most resort type areas. Dining in the hotels is considerably more costly, as much at 100% higher. 4. Cost of groceries for dining in: In reviewing our Excel spreadsheet with the cost of literally every expense for food including trips to Costco, farmer's markets, health food stores, produce stands and grocery stores, we're currently averaging at $47 per day. Considering that I only eat one meal a day (intermittent fasting) and Tom has one main meal and two light low carb snacks/meals, the cost for three meals a day could reach the $80 per day range. The fact that we eat no processed or packaged foods, soda, fruits or snacks also reduces the costs. In part, our costs may be slightly heightened by eating mostly organic locally grown foods which are approximately 10% higher than mass produced foods. The grass fed meat we've been purchasing at the gas station from Curly's Princeville Ranch is no more expensive than the grain fed meat at Foodland. These figures may not be considered high for some travelers but for many they could be prohibitive. These pods are less than one inch long. 5. Cost of airfare: Let's face it, Hawaii is not conveniently located. From most locations it requires multiple layovers and high fares. The average cost for each of our 12 family members that visited at Christmas was $1300 per person, round trip. In the off-season, the fare is as much as 40% less. For the senior travelers with medical concerns, the multiple layovers and long flights may present a problem. Also, fees for checked baggage and overweight baggage is a factor to consider. 6. Recreational Activities: If we were to list the most popular tourist activities in Kauai, as much as 85% require some level of fitness, especially the treacherous and difficult hiking trails. Many resort areas throughout the world have museums, art galleries, historical buildings and sites easy to navigate. Hawaii, especially Kauai, is mostly about nature, although there are a few small museums. Yes, there are many tours in vans and buses but, many of these include getting out of the vehicle to view scenery. For some seniors this may be an obstacle and result in frustration. Many of the boat tours include rough waters with considerable bouncing about which may be difficult for some. Its not unusual to see many downed trees still showing signs of life along the beaches. 7. Medical care: Most residents of Kauai with whom we've spoken, young and old, fly to Oahu for medical care at a cost of around $150 or more, round trip per person, for a daytime flight. If one requires frequent doctor visits, this cost and inconvenience can add up. When adding the cost of taxis, tips and meals when arriving in Oahu, for those on a fixed income, these only increase the expense. Of course, emergency medical care and medical clinics are available on the island but, from what we've determined one may be more inclined to head to Oahu, if possible. It isn't unusual for a patient to be airlifted from Kauai to Oahu for medical care. This type of insurance is vital for the average travelers. (Our insurance policy includes these fees). These downed trees are perfect on sunny days for those seeking a respite from the bright sun. 8. The weather: Kauai is the garden island. It rains a lot. We've seen our next door neighbors arrive for a week's vacation and never experience a sunny day. For us, this is fine. For those spending upwards of $3500 for week's vacation, this could be very frustrating. Many of our neighbors haven't minded the rain and have still spent every day exploring the island. But, for serious hikers, which many are, the trails are slippery and dangerous when wet. A few of our neighbors have experienced minor, non life threatening injuries on the trails on rainy days. For us, rainy days as for many retirees, is a good day to stay home unless we're committed to attend a social event. We've also experienced several sunny days in a row. During our 75 days on the island its been the rainy season. With spring in full bloom, we expect we'll see more sunny days. But, even the summers in Kauai may be rainy. If one is looking to lounge in a lawn chair by a pool, drinking tropical cocktails, occasionally walking along the beach and dining out in fabulous restaurants, Kauai may not be the perfect choice. 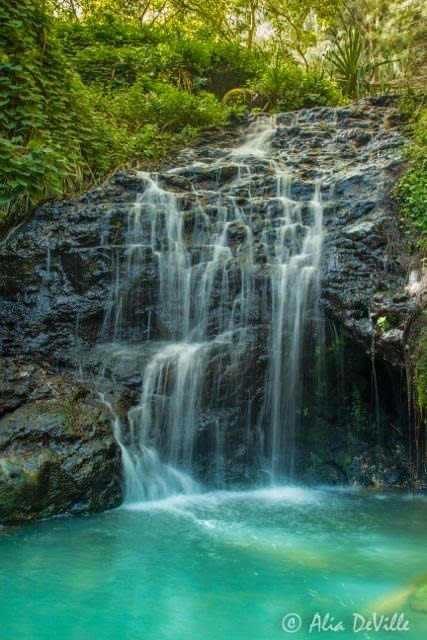 Maui and Oahu may be better choices during their prime seasons with less rain. Of course, it can rain in the morning on any of the islands and become sunny for an hour or more, which is more common than not. The trade winds result in drastic weather changes in a matter of minutes. Many days, we put on our swimsuits hoping for a visit to the pool, only to change out of them a short time later when a dark cloud cover has suddenly appeared. The rope of this tree is ideal for a swinging splash into the water. 9. Long drive to Lihue from many locations for shopping: Princeville has a small shopping center. One may purchase a good pair of walking shoes for $195, a dress or men's shirt for a special occasion for $175 or more, and a pair of costume jewelry earrings for $65. The shopping center in Princeville is not unlike shopping centers in other pricey resort towns. For a 35 minute drive, one can head to Kapaa where there's a more well stocked larger grocery store, Safeway, a Long's Drug and a GNC and more, none of which are located in Princeville. If one desires to make a trip to Costco, Walmart or a regular mall with chain type stores, a trip to Lihue, a long hour's drive in traffic, is necessary. We've been to Lihue on two separate occasions to go to visit Costco and to Kapaa three times. None of these "flip side" observations should prohibit most tourists from visiting this glorious island of Kauai. If only to drive around the islands as far as the roads go, only occasionally getting out of the car, one would see scenery the likes of which they've never seen before. A downed tree on Anina Beach. Children were playing off to the right. Even sitting on the quiet, easily accessible Anini Beach on a overcast day is a pleasing experience which Julie and I enjoyed when she was here. Add the friendly people everywhere, and there's no place on earth that we've seen so far that compares to Kauai. Oops, although I'm dressed for the day, the sun just peeked out. Should I change into a swimsuit? We'll keep an eye on it and perhaps a trip to the pool and a walk later in the day may be on the agenda. If not, we're still content. After all, we're in Kauai and the view from where I am sitting at the moment is unbelievable. Check out these two photos below for that view. This is the view with the screen door open from my seat on the sofa as I post each morning. By standing up and walking a few feet we're on the lanai for this view. Its obvious why we love Kauai. Cats are held in high esteem in Marocco, many wandering the souks seeming to be well fed. We spotted this cat sitting atop a motorcycle as we toured the souks. For details from that date, please click here. If one can safely make it down the cliffs in Kauai to the beach, a treasure awaits them such as in this location, Kauapea Beach, also known as Secret Beach. This is my sister Julie's photo. Many people we've met during these past 2½ months in Kauai have asked if we'll ever return to Kauai. The answer for us is clear. If and when we ever stop traveling the world, having decided to somewhat settle down, perhaps living between one or two or three locations Kauai would definitely be on the list. But, then again, so would Marloth Park, South Africa, certainly my two favorites to date. Tom says he can't commit as to his favorite location since he hasn't been there and its yet to come. Many paths down to the beach begin innocuous such as this ending up to be quite challenging as it nears the ocean. One must exercise extreme caution on many of these trails. Almost every evening on the news we hear of a yet another tourist falling to their death on difficult treks. Today, based on our longer than usual vacation/holiday than the average traveler, we offer our perspective, as to why you, our reader, may choose to visit Kauai (and tomorrow, why not). First, let's start with some basic facts about the "garden island" as Kauai is so well known. Napali Coast: Take an air tour or a boat tour to witness the towering cliffs along Kauai’s North Shore.Waimea Canyon: Enjoy the panoramic views of “The Grand Canyon of the Pacific.”Wailua River: Kauai has the only navigable rivers in Hawaii and Wailua is one of the most popular.Daniel K. Inouye Kilauea Point Lighthouse: Visit this beautiful scenic point at the northernmost tip of the island.Kauai Beaches: From Poipu on the South Shore to Hanalei Bay on the North Shore, explore Kauai’s amazing beaches. There are five major resort destinations on Kauai: North Shore (Princeville), East Side (Coconut Coast), Lihue (Kalapaki), South Shore (Poipu), West Side (Waimea). Kauai's island flower is not a flower at all but a tree producing these beads used for leis. The state flower for Hawaii is the Hibiscus which is abundant year-round. US dollar. Credit cards are widely accepted. Traveler’s checks are accepted at many businesses. Average temperature: 75˚ - 85˚F. The area code for all of Hawaii is (808). Cell phone coverage is readily available in most places if you’re coming from the United States. Internet access is readily available on Kauai and at many hotels. Luxury resorts, hotels, vacation rentals including cottages, homes and condos, as well as bed and breakfasts are located throughout the island. Rent a car at Lihue Airport (LIH) to explore the island. Other options include tour buses, taxis or city buses. Dress casually. Bring a light jacket for nights. Semi-casual dress clothes for restaurants and nightlife. Suits and ties are rarely worn. U.S. standards apply: 15-20% on meals, at least $1 per bag for porters and at least $1 - 2 per night for housekeeping. And hiking trails than any other island in the Hawaiian Islands. 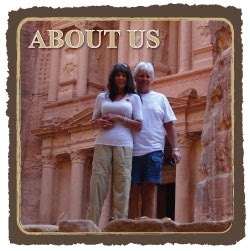 Some of the above facts may be useful in aiding you in making a decision to visit Kauai. Of course, when arriving in the Hawaiian Islands, most visitors tend to stay a few nights or more at the other major islands, as we've done since arriving in late September by cruise ship: Oahu (where Honolulu and Waikiki are located; Maui (where Lahaina and the road to Hana are located); Big Island, aka Hawai'i, where Mount Kilauea is spewing lava at present) and of course, Kauai, the garden island. Many palm tree grow giant pods such as these from which more leaves and flowers bloom. There are other islands to visit, also beautiful but, more remote. Many tourists visit these four major islands before heading out to Molokai and Lana'i which we haven't visited at this time. Plumeria are often used in making leis. Many years ago, when I visited Hawaii, (before Tom), one would exit the plane via steps down to the tarmac. Waiting at the entrance gate, Hawaiian people would be waiting to drape a plumeria lei over the heads of visitors. This tradition has long since passed, unless privately arranged in advance for a fee. As appealing as it would be to see these other two islands, the cost to travel to stay for a night or two wasn't included in our budget. And, of course, we've been happy being able to visit Oahu, Maui, Big Island and Kauai during this extended period of time. This photo, although taken on a cloudy day easily bespeaks the beauty of mountains, lush greenery and the sea. 1. Kauai is the most beautiful island we've seen to date: If you've followed us in our travels its evident we've visited many islands to date, some for only a day on a cruise ship and others for longer periods. Without a doubt, the combination of the vast coverage of lush green vegetation over land and mountains and, the aquamarine sea and pristine beaches have made Kauai the most visually appealing island we've visited to date. 2. Friendly people: Aside from South Africa, there is nowhere in the world we've visited that is easier to meet people. Not only have we been fortunate to meet friend Richard who's been instrumental in including us in many social events with the local residents, which has extended to many budding new relationships. But, on our own we've met literally dozens of friendly tourists most of whom have frequently visited Kauai and keep coming back for more. 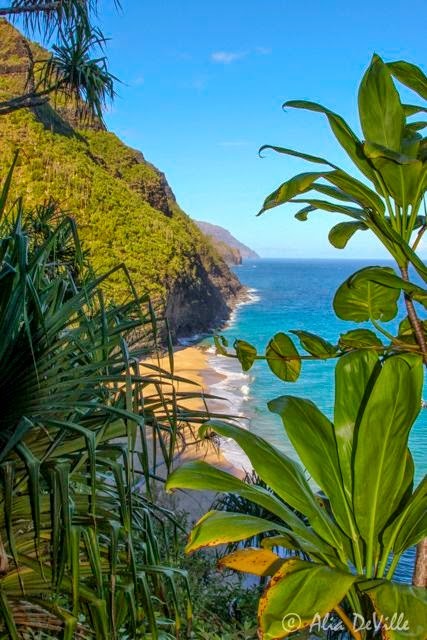 Although there are many beaches in Kauai in some areas such as the northern coast a hike is often required to get down to the beach, at times treacherous and difficult unless one is in great physical condition. 3. Grass fed meat, non GMO products, organic locally grown produce: Although prices on food are high in the islands, we've found the prices on grass fed meat, free range chicken and eggs and organic products to be slightly less than we'd paid three years ago on the mainland in Minnesota. The Hawaiian people are dedicated to keeping their meat, fish and poultry and eggs as free from chemicals as possible. Of course, there's plenty of lower priced farm raised fish, poultry and beef available at the grocery stores if one so chooses. 4. Low crime: Lihue is the largest city in Kauai where the airport, many restaurants, shopping centers (Costco, Walmart and more) are located. As is the case in most larger cities, the crime rate is considerably higher than in other quieter areas. It is these numbers that throw off the overall Kauai crime rate statistics. We'd never stay in Lihue with our aversion to larger cities with traffic, lines and higher risk of crime. Away from the "big city" the crime rate is low. Bear in mind, our comments are based on our perspective both from experience and speaking with locals. There are no available statistic on this variance from Lihue to the more remote areas. Never on a single occasion during our time here in Princeville or in visiting the resort areas and sightseeing in other areas of the island away from the big city, have we ever felt unsafe. That feeling of safety doesn't prevent us from locking doors, securing our equipment and keeping a watchful eye wherever we may go. Its only a one minute walk across Ka Haku Road in front of our condo to the ocean and this beautiful coral sea. 5. Chickens and birds: Although most of Hawaii's wildlife lives in the sea and we've certainly seen our share of the Humpback whales who's season in the islands is coming to a rapid close, we've particularly enjoyed bird watching; the Laysan Albatross and the wide variety of birds even seen from our lanai on a daily basis. But, the chickens have provided us with an enormous amount of heartwarming and laugh worthy experiences we'll always remember. Sure, many locals are annoyed by the constant presence, some taking extreme measures to keep them off of their property. We've heard tourist's complain about being unable to sleep with the rooster's crowing beginning as early as 4 or 5 am. For us, in a matter of a few days, we adapted to the noise eventually not hearing it at all, as is the case for most locals. As for them running around parking lots, on the side of the road, at every venue where food or people may be present, we've loved it all. Also, Hawaii is a bird watcher's paradise particularly when hiking and visiting more remote locations. 6. Multitude of recreational activities: At this point, we've toured almost all of the island accessible by our tiny rental vehicle. There are endless opportunities for surfing, swimming, snorkeling, scuba diving, zip lining, hiking (a hiker's paradise but with many dangerous trails) or simply walking and taking in the scenery. 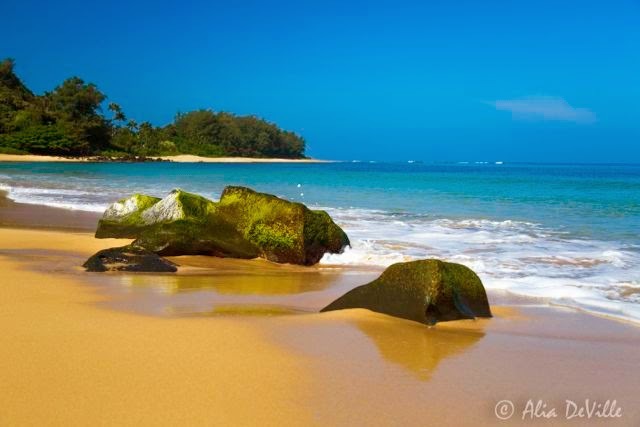 With 59 beaches in Kauai, one could easily enjoy visiting as many as possible. Also, a strong sense of community pervades Kauai and many planned social activities and events are open to the public, some at no cost and others for a nominal fee. Ah, a lazy day sitting under a tree with a cold beverage and good book in hand is all many visitors to the island require to make a glorious vacation. Not everyone is into adventure hikes and sightseeing. Many tourists come to the islands to get away from a "must do" lifestyle, preferring to relax and unwind from busy everyday life. Lounging on the beach, dining in a fun popular restaurant and drinking Mai Tai's is all some travelers need for a perfect vacation. 7. Easily accessible roads: Its easy to get around Kauai and almost impossible to get lost. There are only a few highways that wrapped around the island from beach town to beach town. If traffic and road construction weren't an issue, one could easily travel from one side of the island to the other in 90 minutes. However, with traffic in certain areas and road construction often in the works, one must plan their travels accordingly. The northwest coast of the island is inaccessible by road suitable for most cars. Thus, one cannot drive around the entire island. A scene of a part of the grounds at the Dolphin Restaurant in Hanalei where Julie and I had lunch a few weeks ago. Other travelers may add to or change this list based on their personal preferences. 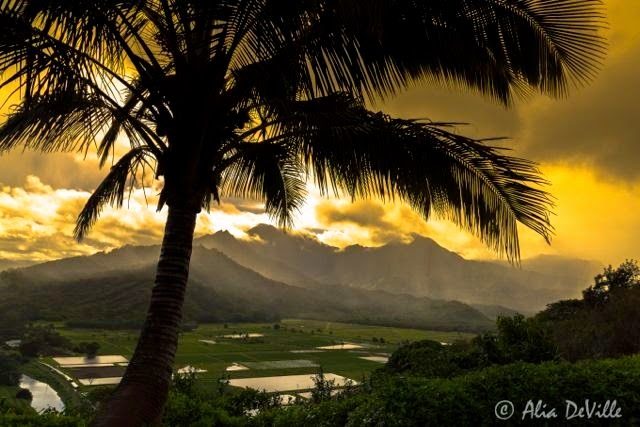 For us, senior citizens, world travelers, these are the reasons that we've love Kauai and are most glaring. If you've spent time in Kauai please comment sharing your experiences at the end of today's post. We'd love to hear from you! We'll return tomorrow with "Part 2, Why would YOU visit Kauai?" including some of the reasons, you may not choose to visit Kauai or for that matter, Hawaii in general. Please check back! We posted this video when it was raining inside our riad in Marrakech. During rain storms we stayed in the salon, one of the many rooms that surrounded the open air courtyard. For details of that day's post, please click here. Last Sunday, at the monthly Princeville Artisan Fair, I met Alia DeVille, a talented and passionate young woman born in Kauai who has adopted the fine "art" of photography. Alia has a skilled and knowledge driven technique and ability of creating some of the most artistic photographs we seen in our world travels. As many of our creative and tech savvy photographers /readers are aware, simply taking a good photo of a good scene in itself is an art; the lighting, the angles and the perspective are integral in the creation of a fine photo. With technology at our disposal, there are many complicated, intensive use apps and tools available, many acquired at extraordinary expense, that in the right hands can take a good photo and turn it into fine art. The ability to create this magic is definitely evident in the delicate and crafted hands of Alia DeVille. Upon meeting her at the fair, I couldn't take my eyes off of her work. As an amateur photographer with my own passion for a good photo, I was particularly interested in her art. For myself, as a somewhat tech savvy individual who's never done more than remove a power line from a photo using the $20 app, Inpaint, or darkening or lightening a photo in the free Fotor app, I can only imagine the intricate work required to turn a good photo into fine art. Alia DeVille has done just that with a finesse one seldom has the opportunity to discover along the way. 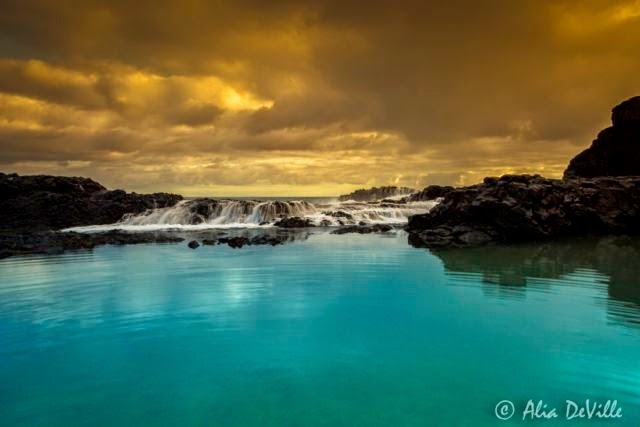 Alia is a self taught professional landscape photographer with a love for nature and her island of Kauai. Since childhood she dreamed of traveling the world as a National Geographic photographer but has found herself entrenched in the exquisite beauty right here at home in Kauai. Alia expresses in her own words, "Born on the North Shore and growing up on with the Na Pali Coast and the trails of Kauai as my playground has seeded a strong passion for the incredible natural environment." For Alia, it its "Not about rules and norms, more about telling a story about a place, embracing the scene and expressing what I see and feel. Waking up to see the mountains towering over the turquoise ocean continually inspires me to capture the immense beauty that surrounds the island." She continues, "Art has always been a passion and expressing my love of art in photography is a dream come true. 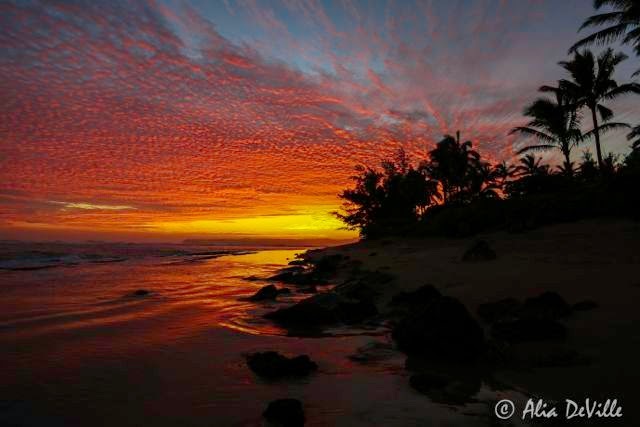 Native plants, the beach, the garden, and the stunning beauty of Kauai, provides endless inspiration for my photographs." "To love what you do is the real drive for my life and photography. Seeking moments that seem to take your breath away and make you see the splendor of the ever changing natural world is what I aim to convey." "In photography and in life you may not know if you’re in the right place, at the right time, but if you turn around before you get there, you just might miss something amazing. Take that step…that adventure… and it will be well worth it." Today, we're excited to share a few of Alia DeVille's photos. For many more exquisite works of art, please click one of the several links posted here today with her name to be directed to her website where any of her art may be purchased, if so desired. Thank you, Alia for sharing your art with us* for our readers and for all of the world to see! *Please respect the integrity of these copyrighted photos by Alia DeVille by not copying them for any purposes whether personal or business use. All rights reserved. Federal copyright law prohibits unauthorized reproduction of these photos by any means and imposes fines up for violation. A year ago today, we posted a series of facts about the country of Morocco including information about its monarchy, population, size and government. Please click here for more details. 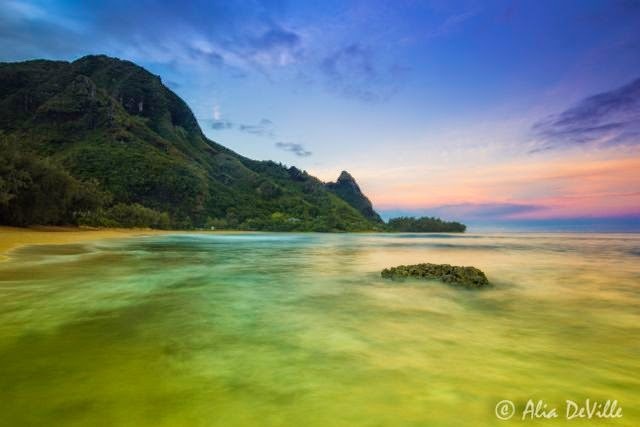 This scene of Hanalei Beach looks out to a sleeping dragon shaped mountain that inspired Peter, Paul and Mary to interpret the song written by a friend, "Puff the Magic Dragon, lived by the sea and frolicked in the autumn mist in a land called Hanalei." There's considerable speculation that the words to the song were mainly centered around smoking marijuana which grew prolifically in Hanalei. 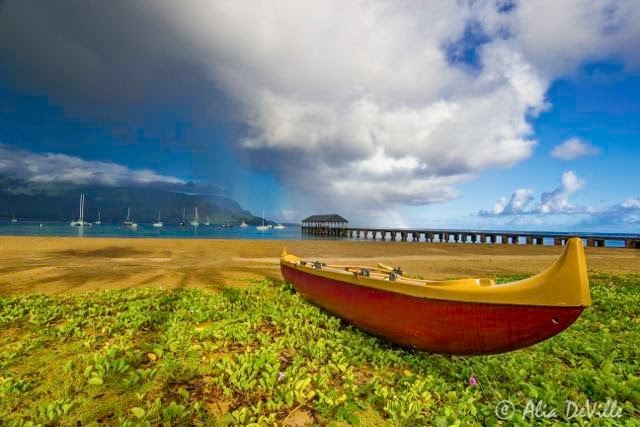 In the future, we'll be writing more about Hanalei where many movies have been filmed over the years. Here's a good video that further explains the shape of the dragon. When I was 12 years old I started writing poetry, shortly after my father passed away from a tragic accident. It's ironic how creativity is often born from tragedy and sorrow. For years I wrote poetry with delusions that one day I'd be a great poet. The heading in today's post is a line from a poem I wrote at 12 that popped into my head as soon as I awoke this morning after a fitful night of tossing and turning. I blamed it on too much hot tea late yesterday, excess caffeine having a profound effect on my sleep. A colorful Adirondack chair behind a rope fence. Its not as if I am worrying about anything in particular. Oh, you know, we all worry about this and that, impeding our ability to sleep. I'm certainly no exception. If I don't have anything to worry about, which I don't, I can always conjure up a short list to keep me busy while wide awake at 3 am. With upcoming travels in mind, flights on small planes, long distances and the unknown as to the quality of where we'll be living, a litany of worry options is always readily available. This puff flower was no larger than the size of a dime. It's fun to notice the "little things." Why didn't I pursue becoming a poet? Life, as they say, got in the way; married at 17, a mom at 19, divorced at 26, owning a business, two boys to raise on my own, left little time for dreaming of poetry. And now, why don't I do it now? Why don't I write the book I dreamed of writing for most of my life? I certainly have the time. By 11:00 am each morning, I'm done posting here leaving my only task for the remainder of the day to get out to take photos for the next day's post, a pleasant task we do more days than not. This tiny blue flower was smaller than the size of pea. Zooming in I noticed this sweet looking bloom. What else do I have to do? Cook a little dinner? Watch Dr. Phil at 3 pm while we're still in the US? Go to the pool and fitness center? Set the table for dinner using dish towels for linen napkins and place mats when none other is on hand? Oh, dear, I don't mean to sound boring. I am never bored, not for a minute. This little brain has a magical way of entertaining me one way or another if merely a flash of apathy wanders through its neurons. Instantaneously, I twirl on my heels and a new idea pops into my conscientiousness and I'm off on a new tangent, excited, energized and interested. In Hawaii, many trees produce berries that proliferate into new leaves and flowers. I decided against writing the book. Most certainly, we'd have plenty of fodder for what may prove to be moderately appealing to the growing senior population as to the nuances of travel for us older folks, whether short or long term. But, I've totally lost interest in writing the book. If we got a publisher (for which we've been approached) or if we self published (popular these days) it would seem like the dreaded WORK. Nothing, money nor notoriety, could possibly appeal enough to either of us to put our ourselves in a position feeling as if we're working again. Nothing. Its hard to imagine that at future points in our travels, we won't be a stone's throw to a beach. As for the poetry? Ah, that desire is long gone. I don't have enough angst in my life these days to be able to translate that pain and sorrow into poetic prose. Nor, would I want to summon up the sorrowful memories of decades long passed. I'm too happy now to write poetry other than occasional playful, rhyme-ful, iambic pentameter. Those days are long gone. Fulfillment? What does that look like now? It looks like this life The simplicity of idle time, the simplicity of taking photos, the simplicity of observing wildlife, scenery and vegetation fills my heart to the brim. Hibiscus, Hawaii's state flower, are everywhere, growing throughout the year. This was surely the largest Hibiscus we'd seen to date, larger than a baseball glove and the first we'd seen in this gorgeous shade or orange. Then, his companionship; the lively banter, the romantic moments and the touch of a hand ever so lightly, coupled with an eye crinkling smile easily fills in any possible gaps if, but for a second I may wonder, I may question, "Is this really my life? How did I get so lucky?" Tom says its not luck. Its a lifetime of hard work and planning. But, I look at it more esoterically, as being a gift from heaven bestowed upon me for patience, perseverance and above all, for hope. The lovely beach overlooking the dragon. Writing here each morning, come "Hell or high water" so they say, has filled me with a deep sense of fulfillment, added to all of the above, that makes me incapable of deserving, or of taking, a moment to pine, to worry, to lay awake at night conjuring up worries. So what if I have a fitful night that seemed "never ending?" The morning light offers up a new day to embrace with awe, wonder and gratefulness and...boredom, dear readers, is never on the agenda. The riad in Marrakech was filled with mirrors. We counted 17 as we took photos of many of them to post one year ago today. For more photos, please click here. PLEASE CLICK THE FOLLOWING LINK FOR THE LIVE ALBATROSS CAM FROM CORNELL LABS HERE IN KAUAI THAT WE'VE BEEN WATCHING SINCE THE CHICK HATCHED. IT'S AMAZING! Often times, the birds, hang out together, that may or may not be related. This could be parents of the smaller bird from a previous season or the bird of another family. As we're certain that all of our readers are aware, we've spent considerable time observing the life cycle of the Laysan Albatross since we arrived in Kauai in January. The adults albatross build their nests in November and equally spend time sitting on their solitary egg. We had no idea that these birds that we'd occasionally seen momentarily landing on our cruise ship or flying above our heads at sea would provide us with such a strong passion and interest in their life cycle and well being. This chick is getting fatter each day. It can survive for many days when the parents head out to sea for food, utilizing it's own fat stores for water and fuel. For our readers with little interest in birds, we hope we haven't bored you with our frequent posting as to their progress. It wasn't too long ago that we developed a keen interest in birds which has escalated as we observed the albatross. With little wildlife besides birds in the Hawaiian Islands, we've found ourselves replacing our interests in big game and wild animals to birds while in Kauai for these long four months, surprisingly never being disappointed. By no means are we avid birdwatchers nor do we profess to know anything about birds besides the albatross for whom we've learned quite a bit. However, the more time we spend in Kauai, the more of an interest we've developed in all species of birds. And yes, every morning and several times per day, when we open or stand by the windows and door to the lanai, the same pairs of Brazilian Cardinals aka, Red-capped Cardinal, Northern Cardinals and Zebra Doves, have stopped by to visit hoping for a taste of the unsalted raw walnuts we'd purchased at Costco. This Red Cardinal stops by several times per day with his smaller female partner, looking for a hand out which we generously provide. Even one particular Brazilian Cardinal has come to know me well enough that his scratchy little feet climb onto my hand to quickly grab at a bite of a chopped walnut from the palm of my hand. My heart always does a flip flop. The Northern Cardinals are shy and there's a male and a female to whom we refer to as his "wife" who often stop by together peacefully sharing the bits of walnuts, at times taking morsels from each other's mouths. We swoon when we watch them interact. Zebra Doves often stop by to scare away the smaller birds from enjoying the morsels of raw nuts we leave for them. Tom calls them "pigeons." At times, there's a scuffle between breeds but, its interesting how the same breeds get along so well. For all we know they have a nest somewhere which they're returning to with our tenderly offered morsels presented several times each day. I stumbled upon the above web cam as I scoured the web in an attempt to expand our knowledge of the Laysan Albatross. Having met Bob Waid, the author of the beautiful book on the albatross, and spending considerable time with Cathy Granholm who has been a docent for the Los Angeles Zoo for over 26 years, we feel we finally have an amateur understanding of the life cycle of the Laysan Albatross. Yesterday, we walked to the beach at the St. Regis Hotel. All beaches are open to the public and anyone can use the beach. The challenge is getting there down steep paths to use the beach. We're grateful to both Cathy and Bob for sharing some of their vast knowledge and familiarity of these amazing birds who nest in their own yards in the nearby neighborhood here in Princeville. The web cam shown here today is from another area in Kauai close to the sea, near the town of Hanapepe. After watching the local chicks develop close to our home and stopping by to visit every few days, we also feel a close affinity to the chick on the web cam, south of here by no less than an hour's drive. Red berries growing on a palm tree. In these past weeks since the chicks hatched in early February, we've had the opportunity to watch the parent's magical process of feeding the chick on the web cam, at a closer vantage point than when we've visited the neighborhood where the families reside. Frequently, the parents head to sea for days or perhaps weeks, searching for food for the chick which when they later return, they regurgitate for the chick to eat. Being able to see this process is exhilarating to say the least. A view of the massage cabana at the St. Regis Hotel in Princeville. Room rates start at $550 per night, more for ocean views. I must admit that I'm a little obsessed with watching the web cam, often finding Tom looking over my shoulder to also get a glimpse. We giggle and laugh aloud over the antics of the chick and then, when on occasion, both parents are at the chick's side feeding, preening, clacking, dancing and singing with pure joy in their hearts. Yesterday, we watched a third, then a fourth grown albatross come by to inspect the chick. Both the mom and dad flapped their wings, clacked their beaks and raised their headed in protest of the intruders. The outsiders quickly departed. Some of the other adult's eggs never hatch and yet both parents will continue to sit on the bad eggs for weeks until finally the egg breaks or disintegrates and they realize they are not going to be parents this season. The views from the St. Regis are exquisite. Later, they take off back out to sea until next season when most will return to the same spot to breed and nest once again. Oh, Life...so magical. In months to come, the parent will fly out to sea one day, usually in June, July or as late as August and never return to the now pudgy chick who sits in the nest day after day waiting for food. When days or even weeks pass and the parents purposely fail to return, the chick's appetite and newfound maturity will finally inspire her/him to fledge at long last, when she/he is already six or seven months old. I can only imagine having the kind of "safari luck" to see the moment in time when the chubby chick in this web cam finally fledges and heads out to sea. Oh, would that we could actually see this miraculous event! Another view of the grounds of the St. Regis Hotel. 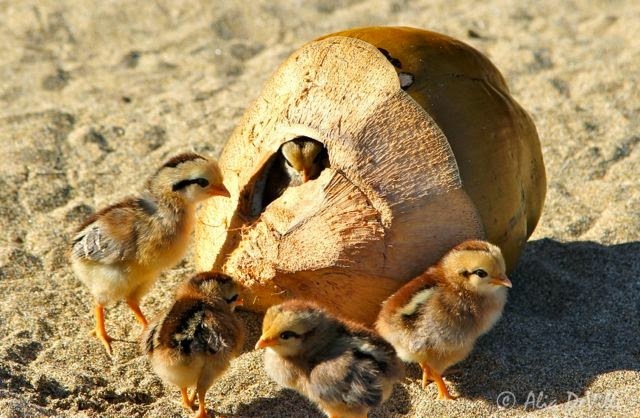 The chick will remain out to sea for five to seven years, resting in the water from time to time, feeding and flying thousands of miles to distant shores, to possibly return to the exact home of their birth at which time they're finally matured and they'll mate, often for life, repeating this same cycle in this same location. Its truly a miracle. Last night, we went to dinner with new friends Cheryl and Paul who are leaving Kauai today, to the local TikiIniki restaurant, a venue we'd experienced in the past. The menu offered few options for me but the staff went overboard to ensure I had a satisfying meal. Tiny flowers for which we "zoomed in" to take this photo. Today, after dining out three times this week, a bit of chopping, dicing and meal prep is on the agenda as we prepare for tonight's dinner and also pot luck dinner to bring to Richard's home tomorrow night. An hour long walk in the neighborhood, an hour by the pool at the Makai Club and time spent at the overlook across the street will provide another fine day in our pleasing, yet simple lives. Doors in Morocco hold a lot of significance in the lives of the Moroccan people. Beautiful and unique doors may be found at every turn when walking through the Medina, aka the Big Square and the souks. For more details and photos, please click here.